Several Canadian racers were called upon by stock car teams as a weapon of choice for the challenges of road racing competition. Having been on display in various forms of open wheel racing and sports cars, racers in Canada have an aptitude to turning left as well as right in motorsport competition. For the 2011 Bucyrus 200 at Road America, there are four drivers driving a maple leaf flag. Two of those Canadian motorsport representatives who threw an NASCAR Nationwide Series stock car around for the Saturday afternoon event were young, feisty drivers wanting to prove themselves for a full-time ride in the United States. The other two are experienced hands who have successfully demonstrated their talents to a world stage. Together, Ron Fellows, Jacques Villeneuve, JR Fitzpatrick and Andrew Ranger belted themselves into stock cars as part of a 42-car field at Road America. After an extended Bucyrus 200 event, the Canadian contingent posted one of the best combined efforts for a non-American group of drivers competing on the NASCAR circuit. All four drivers (two from the province of Quebec and two from Ontario) collected a top-10 finishing position with and for their respective teams. One of Canada's greatest chances of victory on the 4.048-mile circuit in Elkhart Lake, Wisconsin will be driving in his traditional road racing role with the JR Motorsports racing team. Driving the #7 Chevrolet, 51 year-old Ron Fellows rejoins the race organization for the fourth year in a row on the NASCAR Nationwide Series raod course events. One of the most successful Canadian drivers to compete in NASCAR with multiple victories in the Nationwide Series and Camping World Truck Series. Out of 6 total victories in NASCAR, the highlight was winning the Canadian NASCAR Nationwide series round at Circuit Gilles Villeneve. Finishing second at the Road America track in Elkhart Lake, the driver of the #7 Chevrolet expressed considerable eagerness in competing for the Bucyrus 200. "Road America is one of my favorite road courses. It's long and fast, and great for racers. And the setting, in amongst lots of trees and rolling hills, is typical of a few great tracks built in the late 1950's and early 1960's. Watkins Glen (International) and Mosport (International Raceway) come to mind as similar tracks." Fellows' appreciation of great road courses was demonstrated in early June near Bowmanville, Ontario. Ron Fellows is part of an ownership group that is purchasing the historic Canadian Mosport complex. Requiring a ruling from NASCAR, Ron Fellows once again netted a runner-up spot. After the leader under caution ran out of fuel on track, Fellows' #7 AER Chevy appeared to be the new first place runner. Ruled in making an illegal yellow flag pass on the #32 Dollar General car of Reed Sorenson, Ron Fellows was repositioned in second place. Fellows in post-race expressed firm disagreement with the NASCAR ruling claiming that the #32 Chevrolet ran out of fuel. Winning the Indianapolis 500 in 1995 along with the overall CART title, second generation Canadian motorsport pilot Jacques Villeneuve biggest moment of glory was being crowned the 1997 Formula 1 World champion. In recent years, Jacques Villeneuve has been attempting to break through on the NASCAR circuit. Making a debut in the NASCAR truck series in 2007, Villeneuve appeared Sprint Cup series-bound for the 2008 season until prospective funding did not come through for Bill Davis Racing. Hitting a dead end of that deal, Villeneuve remained hungry for opportunities to drive in stock car competitions. Driving a handful of events in the NASCAR Canadian Tire Series, the French-Canadian driver was able to win rides in Nationwide series road races. Driving for Braun Racing for the last two seasons, Jacques Villeneuve returned to Road America in 2011 behind the wheel of the #22 Dodge of Penske Racing. Villeneuve "I was fighting for the win in last year's race so I have some unfinished business at this event, for sure." Rebounding from trouble, Jacques Villeneuve placed the Discount Tire #22 Dodge into a 3rd place finish after 57 laps. At one point of the race, the French-Canadian driver was thrilling the crowd at Elkhart Lake by battling between his former Formula 3 rival Max Papis. Unfortunately for Villeneuve, his podium finish resulted with many NASCAR fans and other drivers citing the 1997 Formula 1 Drivers Championship using less than kind opinions. Maybe or maybe not warranted based on the fact the #22 Dodge Challenger initiated an accident wrecking two front-runners including the #33 Chevy driven by Papis. Happening as the field took the first green-white checker restart attempt, the #22 Dodge dived to the right on the race track creating a three-wide scenario. Initially running on the pit lane exit lane, Villeneuve's right tires would clip the infield grass sending his car into the #11 Toyota of Brian Scott. In post-race, Villeneuve said he knew there was going to be trouble when his #22 Dodge touched the infield grass. Villeneuve said he didn't want to be in the position and made it clear it was not an intentional incident. Nonetheless, criticism following the chaotic NASCAR Nationwide series race would be squarely pointed at Jacques Villeneuve. One of the many young racing talents who attempted to break into open wheel racing, Andrew Ranger succeeded in this goal very early in his career. Finishing 4th in the 2004 Atlantic Series along with netting a rookie of the year title, Ranger was hired to a full-time Champ car ride in 2005. The Roxton Pond, Quebec native's two series in Champ car resulted with sub-par performances which was highlighted by a 2nd place in the Monterrey road course event in his rookie year. After 2006, the instability of the open wheel racing in North America as well as his less than glorious time in Champ Car caused Andrew Ranger to rethink a still young racing career. Taking part in the NASCAR Canadian Tire Series, Ranger would claim 2007 and 2009 championship titles. A terror on road course, the driver eventually adapted to short ovals to dominate. Last season, receiving notice from American teams, Andrew Ranger would go on to win NASCAR K&N Series events as well as a more recent ARCA race at New Jersey Motorsport Park. 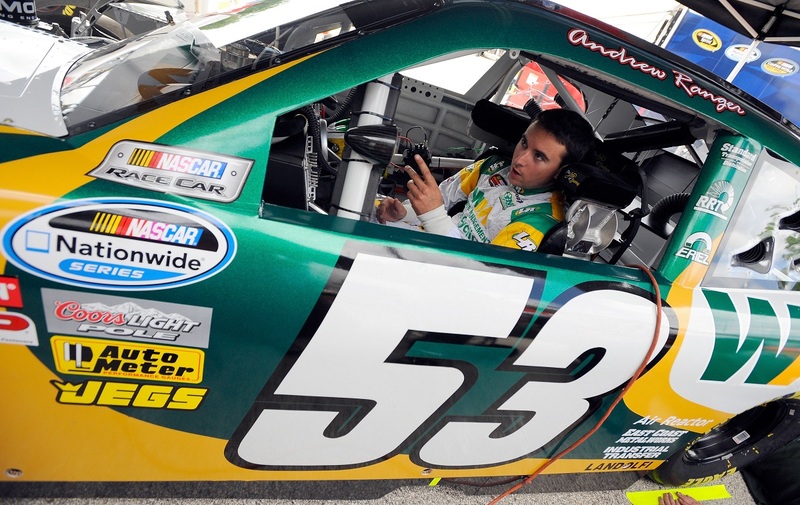 The 24 year-old Andrew Ranger drove the #53 Waste Management Dodge for owner Robert Torriere. Ranger's best NASCAR Nationwide Series finish heading into Road America was 3rd in the 2009 race at Montreal. Andrew Ranger could not top that effort in Elkhart Lake but did record a second-career top-10 result in the NASCAR Nationwide Series. Starting 21st, the #53 car weaved to a solid 6th place. The 2006 champion of the CASCAR Superseries (the precursor to the NASCAR Canadian Tire Series) at just the age of 18, JR Fitzpatrick was brought on a fast track to NASCAR success which took him to the NASCAR Camping World Truck Series. Driving first for TRG Motorsports, the driver was recruited by Kevin Harvick Incorporated (KHI) for select events. Scoring a best finish at Daytona International Speedway with 4th, funding cuts to KHI had JR Fitzpatrick returning to the NASCAR Canadian Tire Series full-time in 2010. 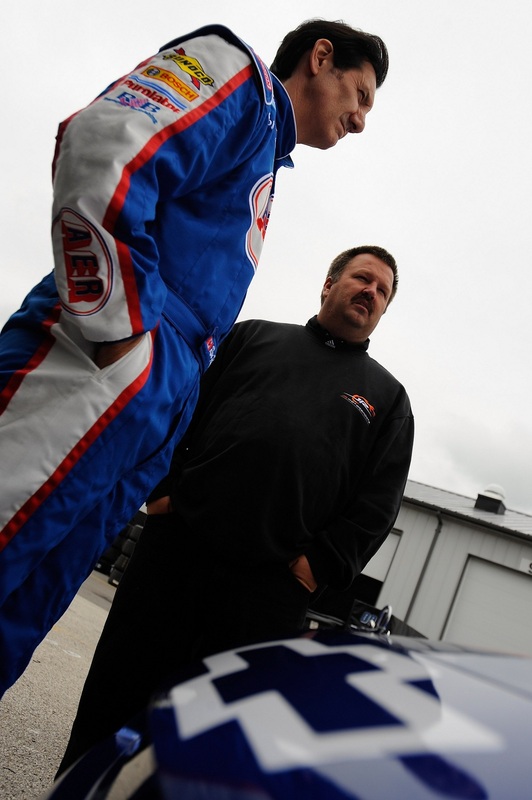 Almost taking the title, 2011 brought Fitzpatrick a new opportunity with a new NASCAR Nationwide team. Go Canada Racing was set up to run select events for the year with plans to run the full schedule in 2012. Determined to be recognized as a Canadian stock car star, Fitzpatrick has resorted to strategy drivers like Kyle Busch utilize for success. Getting the most possible seat time in stock car competition, a most aggressive 2011 racing season for JR Fitzpatrick includes competing in the United States as well as back in Canada. A 3rd start of the year for the #67 Go Canada Racing Ford Mustang, the Road America race could have went very badly for the team early. JR Fitzpatrick needed to take evasive action around the spinning #6 Ford of Ricky Stenhouse Jr. Avoiding contact, Fitzpatrick continued to drive a clean race and was eventually rewarded as lead competition was whittled away in the late laps. Finishing 10th at the NASCAR Nationwide Series at Elkhart Lake on Saturday, JR Fitzpatrick jetted back to Canada in order to contend for the NASCAR Canadian Tire Series event on the 2.54 mile road course at Mosport International Raceway.